Portable Appliance Testing is the electrical safety testing of portable electrical equipment. It consists of a visual inspection and various electrical tests carried out using test equipment. Appliances that have passed the equipment are deemed to be safe to use until the next test date. 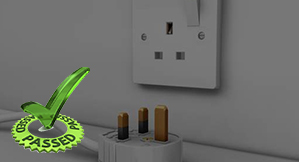 PAT testing can be carried out on all different appliances such as laptops, home computers, cookers, Tvs, charger etc. The appliance tests can be carried out in domestic dwellings such as houses and flats or commercial premises. Although the PAT test is not legally required by Law, it is advisable to do so for your own safety and piece of mind. For both commercial and domestic users in case where an appliance like wall socket or any other every day electricity utensil seems worn out it is advisable to have them PAT tested any hazards attached to using such utensils and in case the utensil is declared faulty, it can be changed or disabled in order to avoid any unintended outcome. Certificate and work in commercial buildings is again the first step towards planning for renovation the certification can basically be of two types i.e., Minor Work certificate or Full Scale Electrical Installation Condition Report.